So I checked out several options and found one that seems to be made for me. It can be adjusted easily to allow painting vertically, horizontally or anywhere in-between. 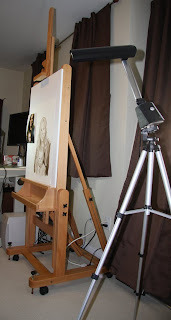 Holds canvases up to 84" high. My hubby graciously offered to go and pick it up for me and help me set it up and even he was impressed with how pretty it looked. It is made of beechwood so has a nice warm glow to it, I could hardly sleep that night, who says I am obsessive. It's a thing of beauty. It looks like it needs stroking. Could I be more jealous?